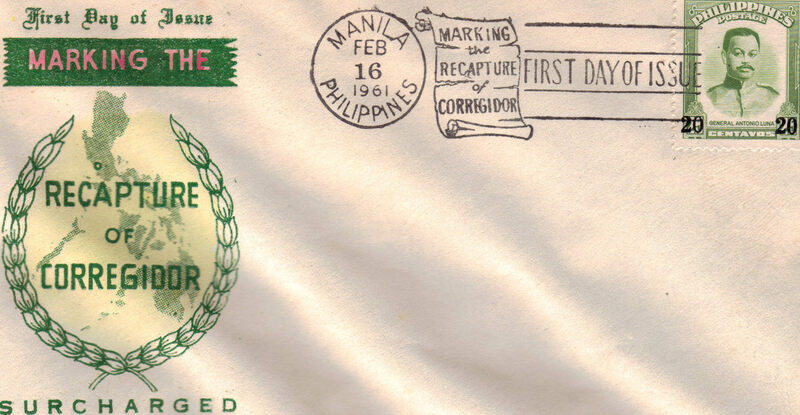 This is the original, official First Day of Issue Marking the Recapture of CORREGIDOR, Surcharged. Issued in Manila, Philipines February 16 1961, stamped with General Antonio Luna. The Battle for the Recapture of Corregidor, Feb. 16-26, 1945, pitted American liberation forces against the defending Japanese garrison on the island fortress. The retaking of the island, officially named, FORT MILLS, along with the bloody battle to liberate Manila the earlier recapture of the Bataan Peninsula, by invading U.S. forces fromt eh occupying Japanese, marked the redemption of the Ameerican Filipino surrender on 6 May 1942 and the subsequent fall of the Philippines. Measures 6-1/2" L x 3-5/8" H Embossed picture Has signs of age storage with smudges of ink from adjacent envelopes in storage, otherwise in exceptional condition in front! Send email if you need additional details. Shipping is 2.25 to anywhere in the USA CANADA. International rates apply. I do hope you enjoy looking through the store for more First Day of Issue Collectibles from the Philippines! Thanks for stopping by!